On our first full day in Israel, we started out at 8:03 a.m., thus setting the precedent for what our guide Ellen would later term "the three minute late tour group." 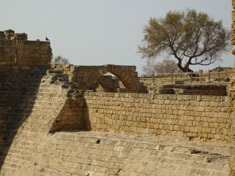 We headed north from Tel Aviv to Caesarea Maritima along the Via Maris (The Way of the Sea). 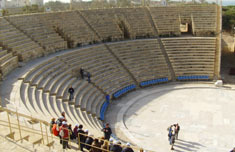 At Caesarea we saw the restored theater, the hippodrome, and the remains of Herod's palace. The palace was built by Herod the Great, occupied later by his son Herod Antipas and later, in the time of Paul, by the Roman governors Felix and Festus. It is believed that Paul made his defense before King Agrippa and his wife, Bernice at the theater (Acts 25:23). We could see the remains of the box seats where the King presumably sat and the stage or floor where Paul would have stood. We saw a replica of a stone inscribed to Pontius Pilate which had been set in secondary use as a stepping stone in a stairwell, by Christians of the Byzantine period. Its use as a stepping stone was symbolic of the Christians' contempt for an Emperor being considered divine. In the palace were the foundations of Herod's swimming pool, built on a point stretching out to the sea. Then we walked through the hippodrome to the walled Crusader city. The hippodrome was where chariot races and gladiator contests (to the death) were held. We exited from the Crusader's city through the main gate, with its characteristic pointed arches, and over the moat. Just outside this area we saw the remains of the Roman aqueduct at Caesarea which brought water from Mt. Carmel. From there it was on to Tel Megiddo. Tels, with which we would become exceedingly familiar, were hills that were built up by layers and layers of urban civilizations occupying the same spot. Usually they were located at some strategic spot for defense or trade or water. 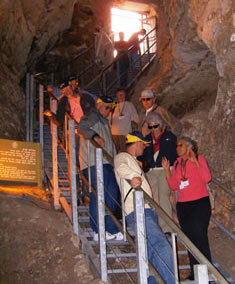 At Megiddo we saw a six-room gate characteristic of Solomon's construction, and an earlier Canaanite four-room gate. We saw stables with dirt floors and stone troughs and a large granary with steps going down the circular wall. We then descended the stairs (183 steps) and traversed the tunnel to the hidden spring. As we drove toward Nazareth, we crossed the Jezreel Valley where the battle of Armageddon is prophesied to take place. Driving into Nazareth we were able to view from the bus one of the traditional sites of the precipice off of which the people of Nazareth attempted to throw Jesus Christ. 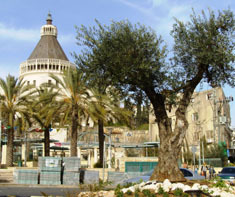 Our first stop in Nazareth was the Church of the Annunciation, the largest church in Palestine, where the angel Gabriel is believed to have appeared to Mary (Luke 1:26-38). The courtyard walls were decorated with representations of Mary donated by many nations. Before entering the church we saw the excavated remains of a cave home and a small museum of artifacts excavated outside the church. The living area of such a cave home would have been near the opening and animals would have been kept at the back, very similar to the type of home in which it is believed Jesus was born in Bethlehem. Then we entered the church to view a similar type cave home which was believed to have been Mary and Joseph's home. Our next stop was Nazareth Village, an outdoor area on a hillside with stone terracing that is actually believed to date back to the time of Jesus. There were people in period costume who represented shepherds, farmers and crafts people of Jesus' day. We were greeted by a braying donkey and a young woman with a cute little lamb that we were allowed to pet. 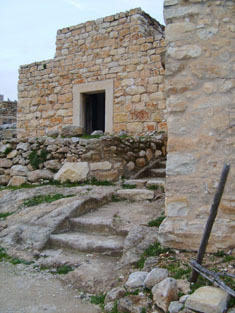 The Village area included a well at which the women of the group gathered, a wine press carved from natural rock, a reconstructed watchtower, an olive press, and a synagogue. There were demonstrations of carpenter work and wool spinning. At the end of the tour we were served a meal of foods that would have been grown on a first century farm. They were grown or prepared at the Village. After a stop at the gift shop, we were driven to the St. Margaret Anglican Convent on a hill overlooking the Church of Annunciation and much of Nazareth. There we spent the night.